Always excited about sunrise? Looking for the breathtaking sunrise from different places may be the greatest moment in your life. 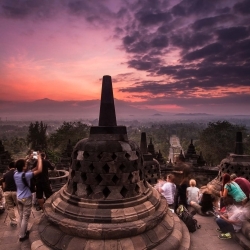 One of the best places to see the sunrise is Borobudur Temple, a Buddhist temple in Magelang, Central Java. Sunrise Borobudur tour by Losari Tours and Travel will be an exciting trip to explore this magnificent temple. Borobudur Temple is a Mahayana Buddhist Temple located in Jl. Badrawati, Borobudur, Magelang, Central Java. This temple was built in the 9th century, and Javanese Buddhist architecture influenced its design. Moreover, it also indicates the influence of India that's been reflected by the Gupta art. Borobudur Temple is claimed as the greatest Buddhist temple in the world. It’s also claimed as the world’s most magnificent Buddhist monument in the world. This Buddhist temple comprises by nine platforms, including six square platforms with three circular platforms. With an exclusive package from Losari Tours and Travel, travelers can see the sun rises in the morning in this Buddhist temple. Borobudur Temple opens for public from 06.00 A.M to 05.00 P.M. Then, how to get a Sunrise Borobudur tour? All travelers who want to see the sunrise must enter the “secret door” from Manohara Resort. This resort is located next to the temple, and all travelers can enter this Buddhist temple start from 04.30 A.M.
Manohara Resort will lend a flashlight to travelers. Then, if the Sunrise Borobudur tour ends, that torch can be returned to the Manohara Resort's team, and replace it with a Borobudur Temple shawl. Moreover, all travelers can also enjoy several breakfast menus, such as fried banana and tea or coffee. Losari Tours and Travel offers two kinds of the exclusive packages; sharing and private package. With the sharing package, you'll join a small group and share your seat with the fellow traveler. You’ll be picked up at your hotel. Then, with the private package, you’ll go to see the sunrise with your family, or friends in one car. The private tour cost is included fuel and driver fee. Sunrise Borobudur tour will be the most unforgettable experience. All travelers will be pampered with the red sky, the warm morning sunshine, and delicious breakfast menus. It will be a paradise for sunrise hunters. The entry ticket you get in Manohara Resort is valid until 05.00 P.M or 06.00 P.M. After seeing the sunrise in the morning; you can also see the beautiful sunset, because the Sunrise Borobudur tour’s ticket not only offers a magnificent sunrise, a souvenir, and breakfast menus, but it also provides the magnificent sunset in the evening. Buying one ticket and you’ll get three unforgettable moments: seeing the lovely sunrise, exploring the history of the biggest Buddhist temple, and seeing the wonderful sunset. What a perfect holiday! Come to Borobudur Temple and take your Sunrise Borobudur tour! Borobudur Temple and all its majesty are waiting for you! Exclude : Entrance fee, Meal, Donation, Parking, Travel Insurance, Guide.